Our new report, Industry Greenhouse Gas and Wage Sustainability released on Mother’s Day in honor of Mother Earth, identifies the climate change effects as well as the wage sustainability of jobs in each industry. We looked at how subregions in Los Angeles County measured in terms of sustainability measures. We found that the San Fernando Valley ranks in the middle tier, emitting less greenhouse gases per job than the County but compensating workers at lower wages. 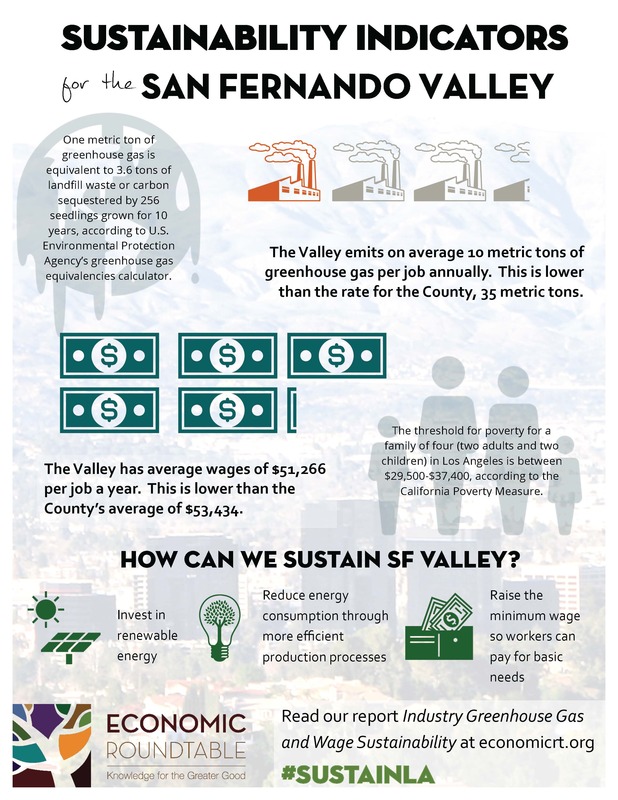 Download our infographic on Sustainability Indicators for the San Fernando Valley. Communities in Los Angeles County have a new set of tools for land use decisions and development policies that decrease greenhouse gas emissions and improve workers’ wages. At the peak of California’s most recent drought in 2009, the Los Angeles economy was in severe recession, with unemployment above 12 percent.